Allahabad University CRET 2019 - The University of Allahabad shall conduct Combined Research Entrance Test- 2019 (CRET-2019) at Allahabad for admission to the degree of Doctor of Philosophy (PhD) (hereinafter referred to as PhD. Program) of the University of Allahabad for the session 2019-20 in the subjects. It conducts its own admission test to get admission in the various fields, i.e. science, commerce, arts, law, etc. In this notification, we have updated detailed information about Allahabad University Admission 2019 including exams, application form, eligibility, exam dates, pattern, etc. All candidates seeking admission to the PhD Program of the University of Allahabad for the session 2019-20, in the subjects listed in para, shall have to qualify in the Combined Research Entrance Test (CRET-2019) to be conducted by the Allahabad University at Allahabad. All candidates, including candidates exempted in Level 1 Test, shall be required to fulfill the following Eligibility Criteria for appearing in CRET-2019 and for admission to the D.Phil. Program. Candidates who have qualified the National Eligibility Test (NET) conducted by the University Grants Commission (UGC)/Council of Scientific and Industrial Research (CSIR) shall be exempted from the Level 1 Test of CRET examination conducted by the University of Allahabad. A minimum score at the Post-graduate Examination of 55% marks (or the equivalent Letter Grade/Grade Point under the seven-point Letter Grade Scale), laid down by the UGC in the case of General candidates and 50% marks (or the equivalent Letter Grade / Grade Point) in the case of OBC/SC/ST/PH candidates. For the purposes of Criterion 1.02.1, the percentage of marks obtained by the candidate shall not be rounded-off to the next higher integer. A minimum average score in the entire academic career of 54% marks (or the equivalent Letter Grade/Grade Point) in the case of General/OBC candidates; or 49% marks (or the equivalent Letter Grade/Grade Point) in the case of SC/ST/PH candidates. Provided further, If the candidate desires to appear at Level 1 of the CRET examination he/she is allowed to appear at Level 1 of CRET examination, but his eligibility shall be determined only on the basis of the marks obtained by him/her in the CRET Exam. All the candidates selected by the University Grants Commission (UGC)/Council of Scientific and Industrial Research (CSIR) for Junior Research Fellowship (JRF), subject to the validity norms of the respective fellowship. 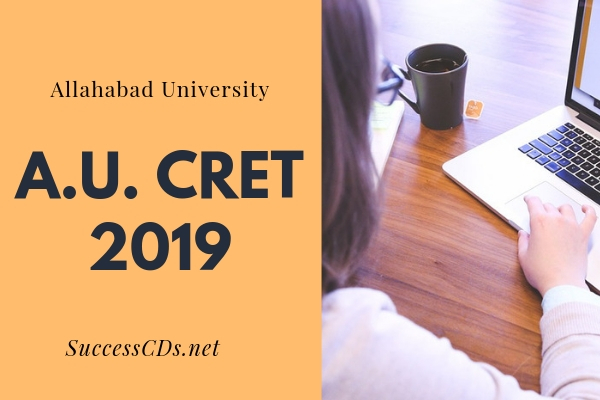 However, such candidates who have been selected for JRF are desires of appearing at Level 1 and Level 2 of the CRET-2019 exam, they are allowed to appear in CRET-2019 exam conducted by University of Allahabad. Provided further the eligibility of such candidates shall be determined only on the basis of the marks obtained by him/her in the CRET exam. Candidates for PhD. in the Dept. of Electronics and Communication with M.Tech/M.E in Electronics Engineering or equivalent subjects or M.Tech/ME in Computer Science & Engineering or equivalent Subjects. Candidates for D.Phil in the Dep. of Earth and Planetary Sciences with M.Tech in Geology/Applied geology or Geo-Physics who have valid GATE score before the last date of applying for CRET and have a GATE score of not less than 75%. Section A: General Awareness, Academic and Research Aptitude: This Section of the paper will comprise of 50 multiple choices type objective questions of the subject opted by the candidate. All questions are to be attempted. Each question carries four marks. Duration of this Section will be 01:30 hours. Section B: Subject Proficiency in the CRET 2019 subject applied for: This Section will comprise of 50 multiple choices type questions of the subject opted by the candidate. All questions are to be attempted. Each question carries four marks. Duration of this Section will be 01:30 hours. A candidate who fulfils the minimum Eligibility Criteria and seeks to appear in CRET-2019 in a Subject that is available and is also admissible to him/her must complete, and submit through the Internet, as per modality and schedule set out in the following paras, the prescribed Online Application/Registration Form for appearing for the Level 1 Test /Level 2 Test /Level 3 Test (as the case may be) at CRET-2019 in the concerned/admissible Subject and must remit, within due time, the prescribed Test Fees to the University. Candidate is strongly advised to familiarize himself/herself with the Schedule for different processes/stages of CRET-2019. Review and ensure the correctness of the details of his/her academic record at the High School and Intermediate (or equivalent) and the Graduation and Post-graduation level, for purposes of making required entries in the On-line Form. Get his/her latest Passport-size Colour Photograph and his signature scanned by Computer, so that the scanned Photograph and Signature can be submitted with the Online Form; the original of the scanned Photograph should be carefully preserved for submission to the CRET-2019 Committee in the manner specified.